Marine grade washers - Our complete line of washers and other fasteners is available online, with a large number of styles, shapes, sizes and metals. 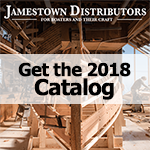 Jamestown Distributors offers flat, dock, fender, lock, finish, metric, internal and external tooth, copper burr, and copper rove style washers. Many are available in different metals, ranging from stainless steel to copper to galvanized to silicon bronze and brass. Inch-based and metric sizes available. Washers are a key component in boat building, generally used around a bolt or a screw to form a seat for the head or nut. We offer a wide variety of fasteners in different sizes and metals for your every boat building need. Flat Washer The most common type of washer, used to distribute the force/stress of a nut or bolt. They can also help reduce friction and heat when turning a bolt or nut. Basic flat style washers are available in two types of Stainless Steel, Brass, Galvanized, and Silicon Bronze. Dock Washers Also used to distribute tightening force, but are larger in terms of their outside diameter, and thicker than normal. Available in galvanized. Also feature a larger outer diameter, and are used for distributing force/stress as well. They are available in stainless steel and 316 stainless. Lock Washer Prevent a nut from loosening by placing tension on it. Notice that lock washers are actually split and slightly coiled. This is what gives them their locking characteristics. Available in inch based and metric sizes (s/s only), in galvanized, 316 ss, stainless steel, and silicon bronze. Finish Washer Finish or Finishing Washers are used mostly for decorative purposes to give projects a 'finished' look. Available in brass or stainless steel, they work best with oval or flat head screws. Pyramid Washer Zinc-plated, star- shaped, and perfect for use with U-bolts in heavy duty applications. External Tooth Washer A locking type as well, utilizing external teeth (looks almost like a gear) for tension. Available in stainless steel. Internal Tooth Washer Also feature locking 'teeth', but have generally smaller outer diameters than the external type. Available in stainless steel. Copper Burr Copper Burrs, also known as copper washers, are often used with Copper Common Nails to create a traditional copper rivet, similar to clinch nailing. Copper rivets are utilized in classic planked wooden boat construction. This guide allows boatbuilders and woodworkers to match up the correct washer size with the fasteners they are using in terms of inner and out diameter.